Digital subscriber line (DSL) service is a high-speed data connection method that uses the ordinary telephone lines that come into your home or business. Utilizing a star topology, as shown in Figure 1, DSL provides two benefits important to VoIP (voice over Internet protocol): excellent fault isolation and better throughput due to less resource contention. Figure 1: DSL star topology. DSL uses the public switched telephone network carrier services infrastructure (PSTN CSI) and is therefore a switched transport service. All customers must have at least basic plain old telephone service (POTS) to use DSL. After you’re running both POTS for telephone service and DSL for data, you can enter into an agreement with any VoIP provider to obtain VoIP services. The VoIP provider either gives you a VoIP adapter box or requires you to purchase one. You can keep the POTS line service while running VoIP through the adapter box, essentially making two calls at the same time on a single phone line. If the VoIP provider you select doesn’t have an unlimited plan, seeks to limit your minutes, or charges you by the minute, consider using a different provider. Setting up a VoIP connection through your DSL connection is similar to connecting through a cable modem. The primary differences are that you use a different adapter and that adapter connects to the DSL router or modem rather than to a cable modem. 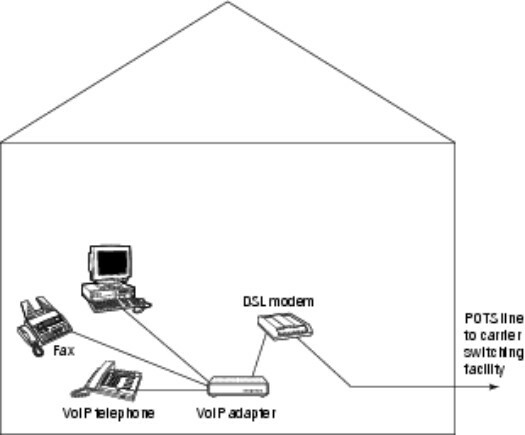 Figure 2 illustrates a normal VoIP connection through a DSL connection. Figure 2: Connecting VoIP through a DSL connection. 1. Connect the VoIP adapter box to the DSL router or modem. 3. Install the software supplied by the VoIP provider. 5. Connect a microphone and speakers or plugs to a VoIP headset or handset. DSL does not require you to abandon your POTS telephone nor its services. Using an inexpensive splitter that plugs into the VoIP adapter box, you can continue to enjoy POTS telephony as well as VoIP. 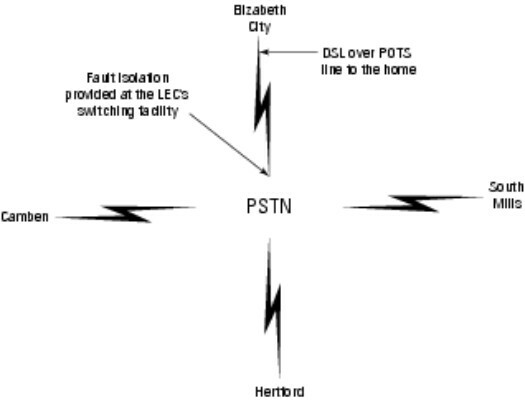 DSL runs over the same PSTN CSI that carries your POTS service. To accomplish this feat, the DSL signal is modulated at a higher frequency than the frequency used for regular voice. Analog POTS lines can’t support VoIP, but DSL technology — piggybacked on the POTS line — can support it. DSL uses multiplexing equipment that amplifies, regenerates, and reconstructs the VoIP signals so that the packets can travel to and from the Internet in an acceptable manner. A DSL connection is like having two channels that are each operated using different networking techniques, both going over the same physical line. One channel is your analog POTS line, and the other is the digital DSL service.